When I started brewing I bottled all of my beer like nearly everyone else, I absolutely hated bottling. Not only is bottling time consuming and annoying, the ending product is highly variable. I switched to kegs fairly quickly and was content to use picnic faucets for quite a while. 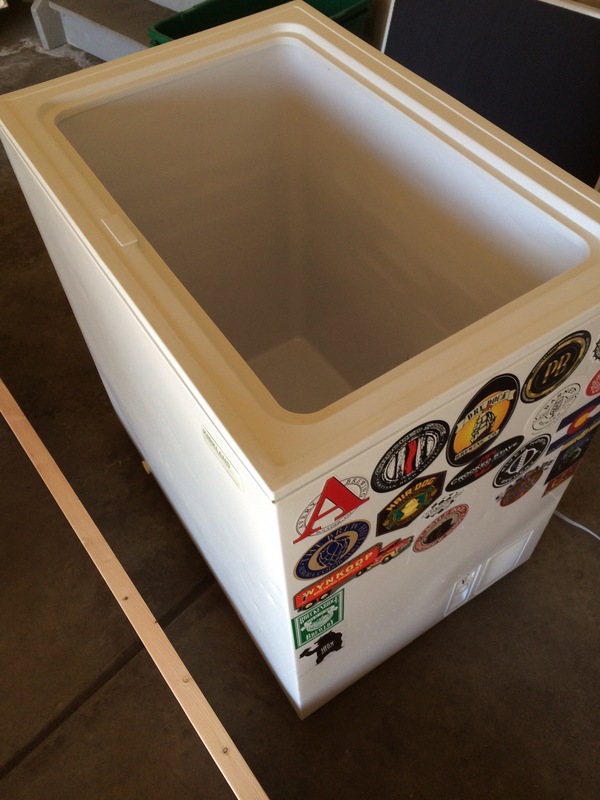 Recently, I decided that using a freezer for a fermentation chamber was not ideal. Freezers don’t contain a condensation method and I’ve read that this can cause the lines to rust over time. I decided to make the switch to using a fridge to ferment and a freezer to dispense beer. My freezer fits four kegs and using picnic faucets was fine, however, I wanted to add a little flare to my homebrewing. I’ve always been very jealous of the keezer builds people have done online, I think there is something damn cool about having your beer come out of real taps. 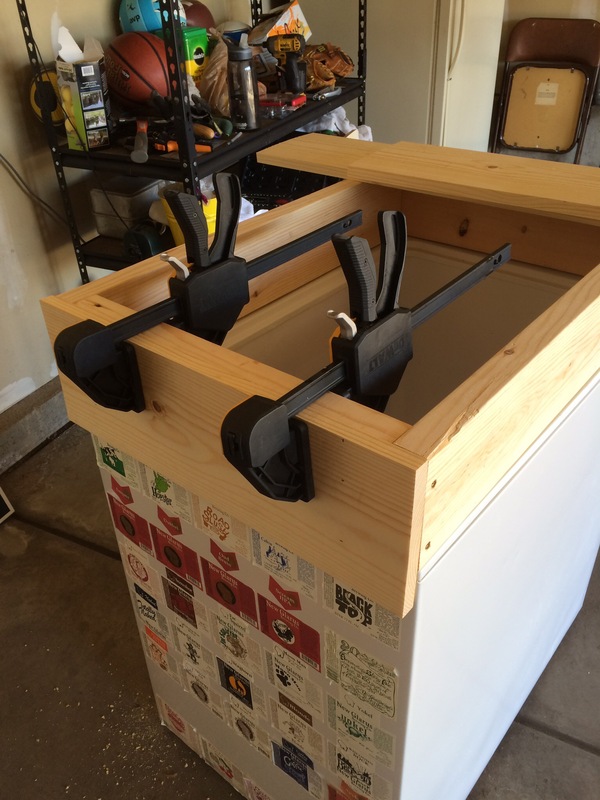 Here is a quick how to on building a keezer like mine. Note: the design for this was shamelessly taken from the homebrewacademy.com, thanks for all of your great videos! 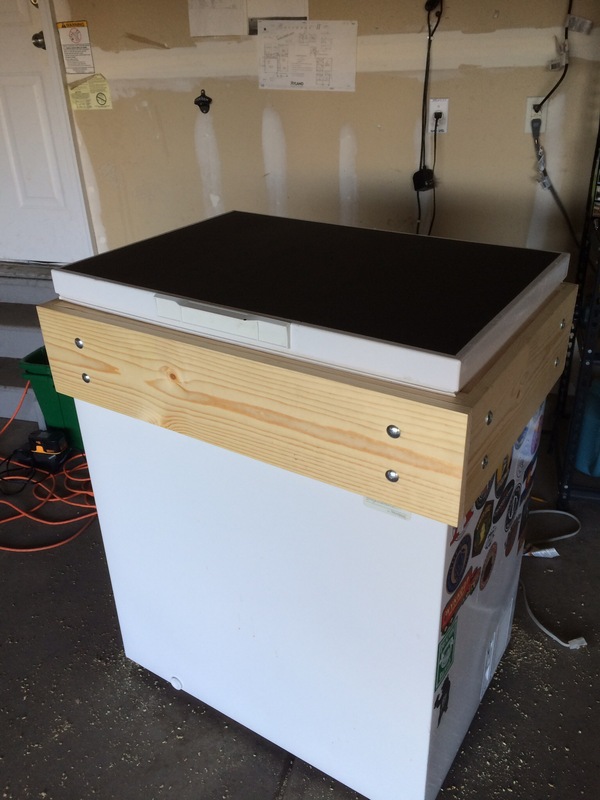 This keezer is designed to have an inner collar that sits on the freezer with an outer facade that hangs down over the freezer. The shanks will go directly through the collar, no freezers were harmed in the making of this how to! A huge thanks to my neighbor Phil who helped me make this in exchange for beer, and my wife for putting up with my beer crap. 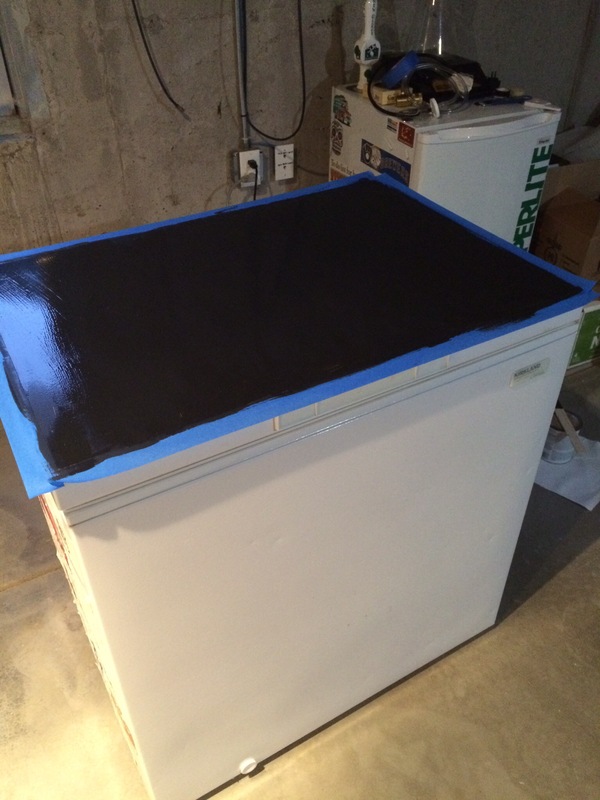 Before starting the keezer build, I painted the top of my freezer with chalkboard paint obtained from the home depot. I applied probably six coats before I was fully satisfied with the ending result. Remove the lid from the freezer. There are four screws on each hinge which come apart very easily. Be careful when removing any spring loaded hinges, mine had one spring loaded hinge. We used 2×6 pine and 3×1/2 inch gold wood screws. 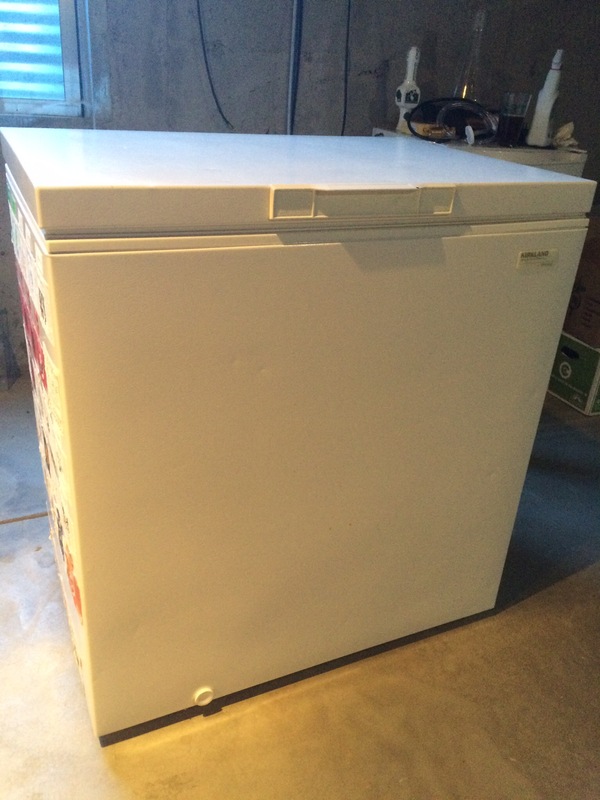 Measure the top of the freezer so the box sitting on it would be perfectly square and flush. We used a simple joint design instead of cutting 45 degree doings. Then we cut the wood for the inner collar. With the pieces cut screw together the inner collar on top of the freezer. It fit perfectly with no overhanging. 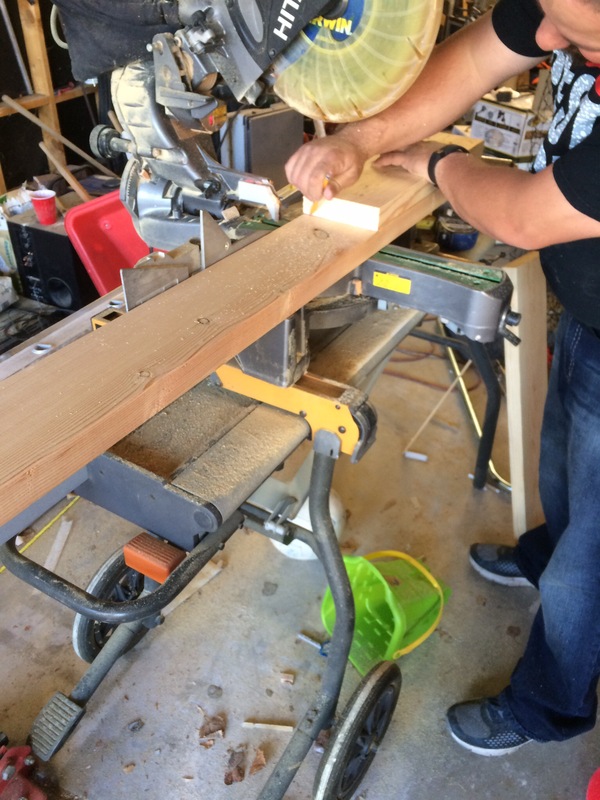 We used 1×8 pine and attached with 3/8″ bolts that had a lenght of 3″. With the inner collar in place measure and cut the wood for the outer collar. There was a slight hiccup here as the freezer actually slightly bows out from the lip. The inner collar was perfectly flush with the top of the freezer. However, as this picture shows, the facade is slightly pushed out by the bow in the freezer. If you are building this style of keezer make sure to measure the inner collar from the wider lower portion if your freezer bows out. We fixed this by moving a side piece of the inner collar out 1/4″ to compensate for the freezer width. The facade was then attached to the inner collar. Due to the bow in the freezer there is a 1/8″ gap toward the back of the keezer which I can live with. 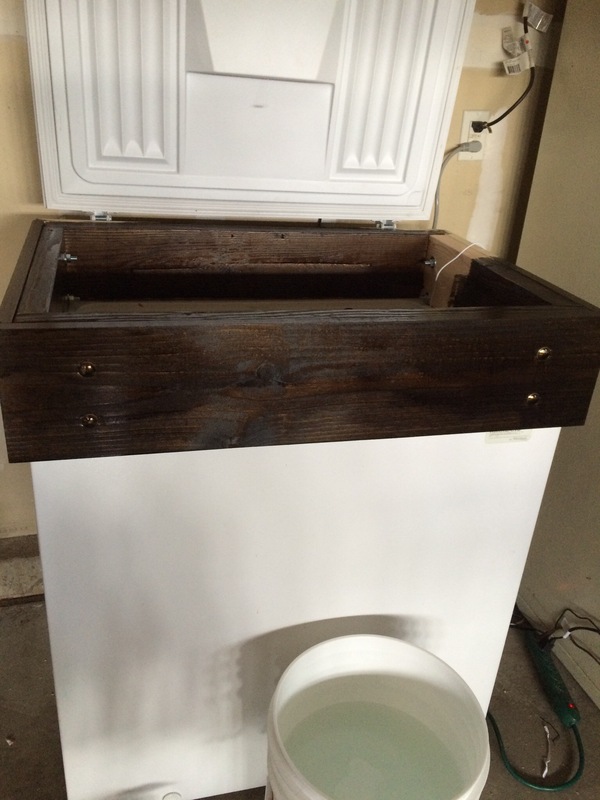 We used 2″ gold wood screws instead of the short screws that originally attached the lid to the freezer. Place the lid on top of the box and screw the hinges into the wood collar. The lid now opens as if the collar is the top of the freezer, success! I used Minwax Wood Finish Jacobean color purchased from home depot. I found this step to be slightly messy, I recommend using rubber gloves to save your hands from a week of staining (like mine were). To stain, follow directions on your can. My directions were apply a coat with a brush, wait 15 min or longer, and remove excess with a rag. I applied four coats total. The shanks were 1″ diameter so we drilled four 7/8″ holes in the collar. There appears to be a great debate on some forums over the size hole for a 1″ shank. A 1″ hole is larger thank the shank itself. Once attached though, there is no play in the shank. You could use a 7/8″ or 15/16″ hole with success. The 7/8″ hole worked nicely for us. This is as simple as sliding the shank into the hole and attaching the nut to the back of the shank. I purchased Perlick 630SS with 4 inch stainless shanks. Having no experience with tap faucets, I went to the Internet, online reviews generally recommended Vent-Matic and Perlick 630 over the rest. The Vent-Matic were probably my first choice as they looked very high quality, however, the Vent-Matic store appeared to be out of business and the owner did not respond to an email questioning how to buy his faucets, so I went with the Perlick. The Beverage Factory had a great deal when I was browsing and I got a combo of the faucet, shank, nuts, and black knobs for ~$50 each. These faucets are beautiful and I’m quite happy with them. 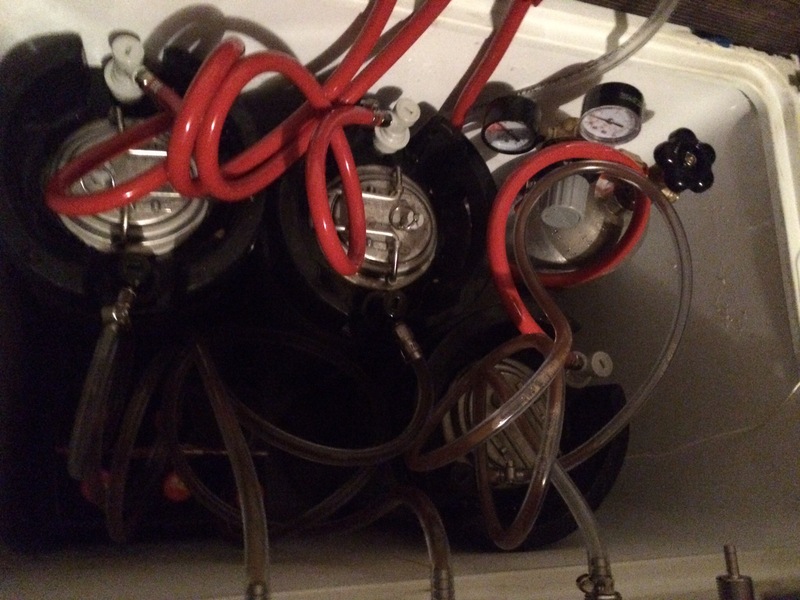 I use a three way manifold because my old fridge could only hold three kegs. Eventually this will be upgraded to four gas lines. Red line was used for the gas and clear for the liquid. This was done simply for the ease of telling the gas/liquid lines apart, there is not any difference between red/clear gas line. The length of the gas lines is three feet and the length of the liquid lines is five feet. It was recommended to to me by Dry Dock Brewing to use 10 foot liquid lines to help keep the serving pressure down, I didn’t fully take their advice and went with five foot lines because I hate a tubing mess. If I can’t live with the potential foam I can always switch to 10 foot lines later. Pour a home brew and admire the keezer. 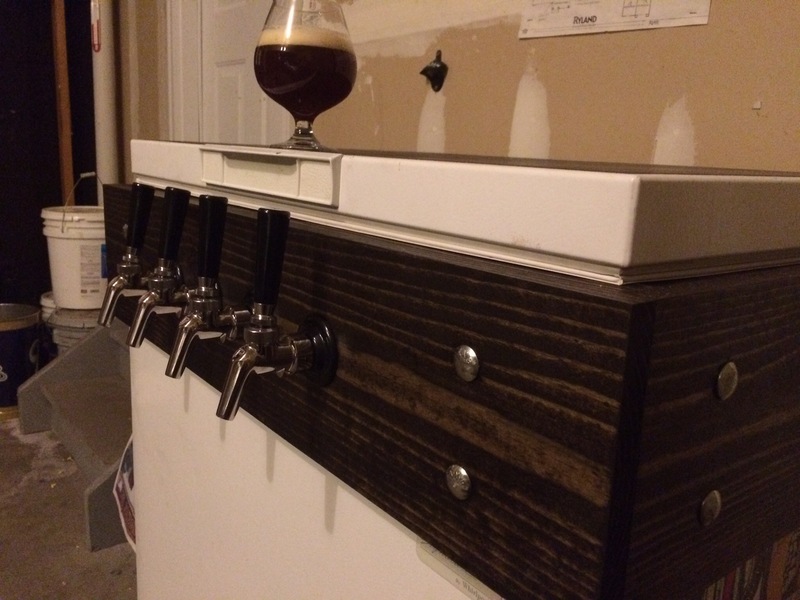 I’m astonished by how easy it was to build a very quality looking keezer. Thank you very much to the homebrewacademy.com for the how to videos they were quite helpful. It’s a really quite a giddy feeling to be able to go into my garage and pour a beer from a tap, in my mind it makes my beer taste more official. 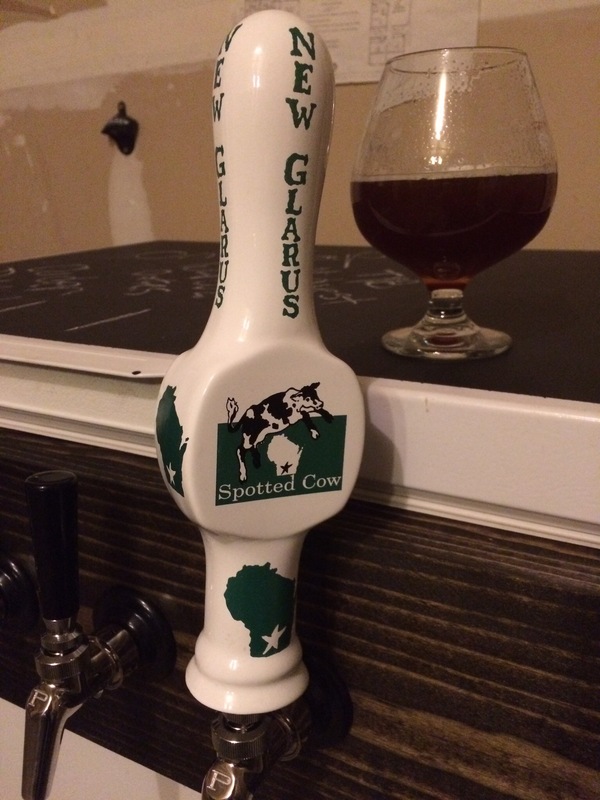 Next step, brew my spotted cow clone and finally be able to enjoy that beer from this fantastic handle my mom got me for Christmas a couple years ago! As always feel free to email me with future comparison experiments or ideas. 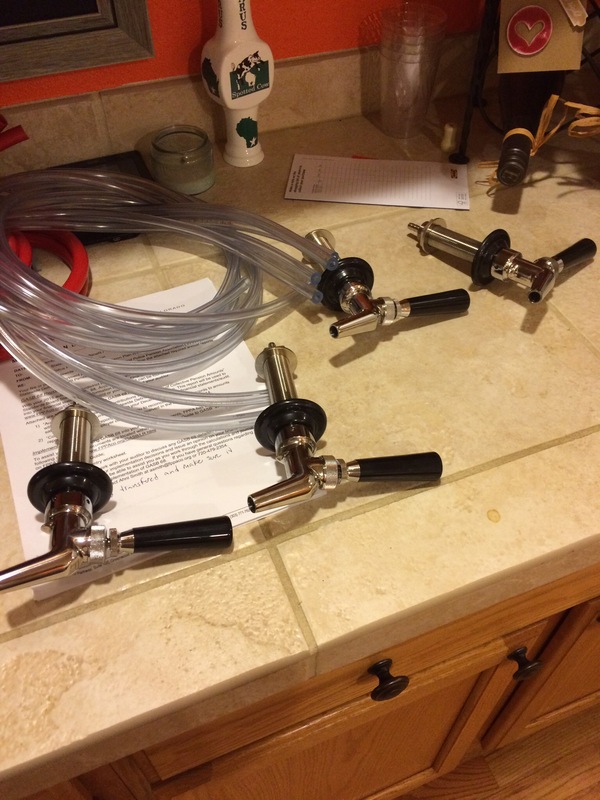 Steps I plan to do in the future to make the keezer better. Install a computer fan to circulate the air in the keezer. I went with the Cooler Master Sickleflow 120 from amazon as recommended by Brulosophy, mainly I got it due to the price. Build a recirculating line cleaning system. I went with the EcoPlus Eco 264 290 GPH submersible model. Also, I purchased a SS Carbonation cap to create a super easy recirculating line cleaner. Thanks to Home Brew Finds for the easy how to. Use silicone caulking to attach the collar to the freezer on the inside. I’m not sure this is necessary but it will prevent any potential drafts and save energy maybe. Install insulation. I probably won’t do this because the collar looks really cool on the inside but maybe. Previous Extract Experiment 1: Does Late Addition of Extract Make a Difference? What serving pressure did you use with 5 foot lines? Lol thanks, I’m writing on a new platform just left this up for posterity and indexed info for people.